Augmented Reality (AR) is such a cool concept, especially with apps like Pokémon Go and Quiver Vision. Ever since I learned about AR, I’ve been interested in working it into my programs and services. AR is an avenue to bring art, illustrations, and book trailers to life. But, can AR be used to do a storytime? Yes! Every year more authors and illustrators are incorporating augmented reality into their books using apps. In library school, I learned about some AR non-fiction books like the iExplore series, but I didn’t know any AR picture books. So I did some searching and found a handful of books that I could read aloud to a 3-6 year-old audience. When doing the storytime, have a table or surface to rest the book on so that you can manipulate your tablet with two hands. Open the app for the correct book on the iPad so you have the camera ready, and connect it to the big screen. Read the book like you normally would, showing the pictures and reading at the same time. Stop and put the book down for each AR component. Hold the tablet over the picture and the AR image will appear for everyone to see on the screen. Augmented reality books bring the stories to life with moving images and interactive elements. Each story was engaging and the kids wanted to repeat the different AR experiences. 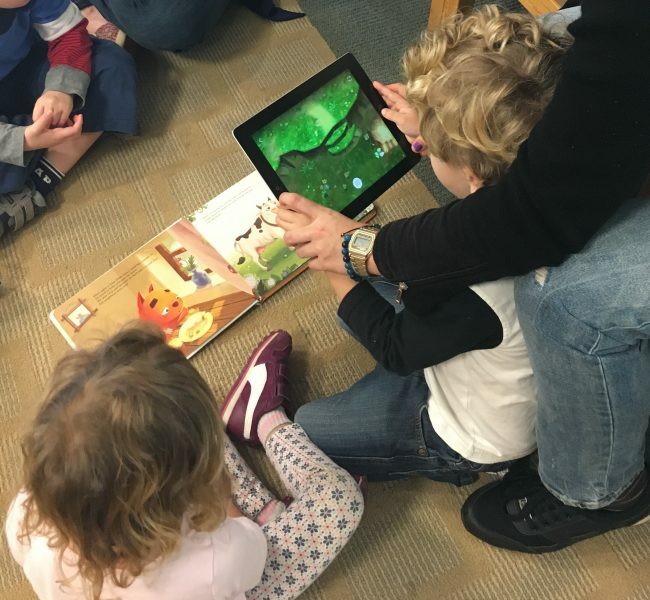 At the end of my storytime, the families got to use other iPads I had to explore these AR books and others on their own. There was a lot of excitement and interest in these digital books. Have you used augmented reality books? What are your favorite titles? Tori Ann Ogawa is a youth services librarian at Kitsap Regional Library in Washington and is writing this post for the ALSC Children and Technology Committee. You can tweet her @ToriOgawa. This post addresses the following ALSC Core Competencies: III. Programming Skills.